SAN DIEGO — Expansion plans for San Diego’s waterfront convention center are moving forward, following the Board of Port Commissioners’ approval of an Environmental Impact Report (EIR) for the $520 million project. The key actions taken by the board in unanimous votes included certification of the final EIR; approval of a port master plan amendment; approval of an amended convention center lease; and approval of the Port of San Diego’s financial contribution of approximately $60 million over a 20-year period. The mayor, who was praised by the commissioners for his strong leadership in moving forward with the proposed expansion, added that each year, the city loses potential business because the existing convention center space is inadequate. “That’s hundreds of millions of dollars — and a lot of jobs — that are lost each year to other cities with larger facilities,” he said. The next step for the port will be to forward the Port Master Plan Amendment to the California Coastal Commission, which must approve the project — including hotel and convention center expansion plans. During the Sept. 19 meeting, several people spoke in favor of the project, while others said the EIR did not adequately address the project’s environmental impacts. The proposed convention center expansion includes 220,150 square feet of exhibit hall space, 101,500 square feet of meeting rooms and 78,470 square feet of ballroom space. 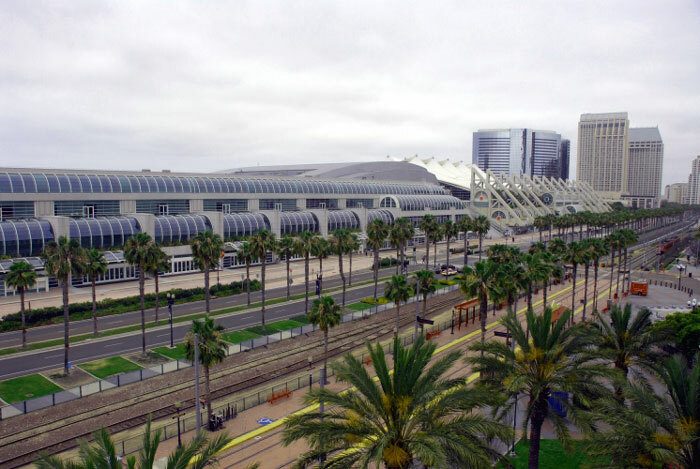 In addition, the project would include a 5-acre rooftop park/plaza, 45,000 square feet of visitor-serving retail space and a 500-room expansion of the Hilton San Diego Bayfront Hotel, located just south of the convention center. The project is expected to create an economic boost to the city and region, providing more than $13 million in new tax revenue, nearly 4,000 construction jobs and an additional 6,885 permanent jobs and generate millions of dollars in additional revenue for the region’s economy, according to the Mayor’s Citizens Task Force on the convention center expansion. The city estimated the total construction cost of the expansion at approximately $520 million. Besides the port’s contribution, the city intends to finance the expansion through a special tax on hoteliers and city revenue generated through the Transient Occupancy Tax. There are still key actions that must be taken, including various approvals by the Board of Port Commissioners, the city of San Diego and the California Coastal Commission’s certification of the Port Master Plan Amendment. If Coastal Commission approval is gained, port staff will ask the Board of Port Commissioners to authorize the issuance of coastal development permits, allowing construction to begin on the hotel and convention center expansion. The city has said that construction could begin in 2013, and the expanded convention center could be completed in early 2016. The project is, in part, being funded by a new hotel room tax approved by local hoteliers earlier this year, but the tax plan has come under scrutiny. San Diego city officials are reviewing the tax, and the current and potential legal challenges the tax is facing. No hearing date has been set. A formalization of the port’s plan to commit $60 million to the expansion was also finalized at the Sept. 19 meeting.